Lexi Krosky, 17, and her mom, Rachel, have gone from counting down the days, to the hours to now the minutes to the debut of the new Fuller House series on Netflix tomorrow. There’s no bigger Full House fan than Lexi, who has always been drawn to the show’s cheerful humor and fun family dynamics. She has read the Full House books, sent fan letters to the cast, and watched the original shows so many times she has the dialogue memorized. 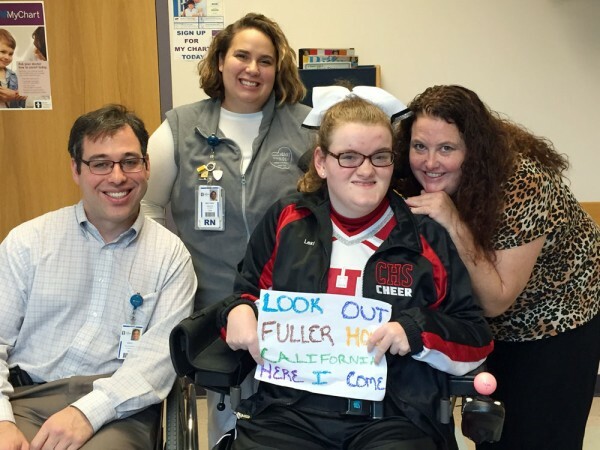 Her love for all things Full House has helped Lexi deal with the pain and obstacles of living with cerebral palsy. 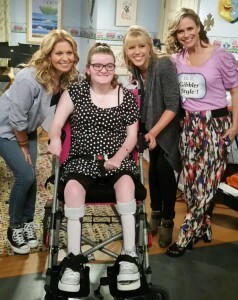 Brittany Parise, Lexi’s favorite nurse at Akron Children’s Hospital, knew about her love of the show and helped make it possible for Rachel to connect with star Candace Cameron-Bure (aka DJ Tanner), who then invited Lexi to come to California to spend a day at Warner Brother Studios meeting the stars and watching the cast film an episode of the new series. And now after several months of waiting, Lexi and Rachel are ready to binge watch the 13 episodes of Fuller House beginning tomorrow. Rachel and Lexi don’t know which episode number they got to see taped on their day at the studio but they’ll know it when they see it. The plot focuses on a San Francisco Giants baseball game and features a guest appearance by Hunter Pence, the righter-fielder for the Giants. 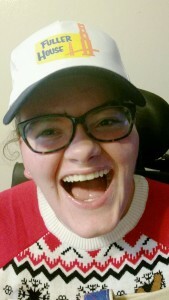 Lexi will be watching the new shows wearing her Fuller House hat and shirt that she received as a gift from the cast, following her trip.